As you can see from watching the Delaware River episode of Going Ike! most of the day was tough but once we figured out that we should be throwing spinnerbaits we ended up getting on them. There’s a lesson in that. You don’t hear or see much about them these days but spinnerbaits will still catch bass when conditions are right. We proved that. That’s why I always keep a collection of them in my boat. There are times when nothing else works quite the same. Like most of my tackle, though, I select my spinnerbaits carefully. First of all, I always carry Molix brand lures. They’re made to withstand the demands of Ike style fishing. (No one ever accused me of being gentle.) And, they come in a wide variety of sizes, weights and with several blade combinations. You can purchase them at Tackle Warehouse. They have them in stock. If they don’t show what you want on their website give them a call. Tackle Warehouse is a first-class operation. They’ll help you in any way they can. 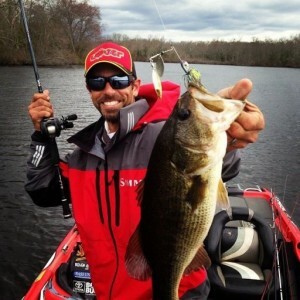 And that brings me to what I consider the most important thing about a spinnerbait — the blades. I carry a ton of Colorado, Willow leaf and Indiana sizes and colors. That’s critical. If you can’t customize your bait, you can’t fish the moment. You can get all the blades you’ll ever need from Tackle Warehouse. My Colorado blades are for dirty or stained water, or when I’m fishing in deep water near the bottom. I want the hard thump they give my bait. I’ll put Willow leafs on when I want flash, like when the water’s clear and it’s sunny. The Indiana’s are in my box in case I want some thump and some flash at the same time. I throw single blades and double blades. There are three basic ways to fish a spinnerbait, and then there’s a fourth that’s the best. You can throw them out and wind them back. That’s a basic retrieve that’ll work under most conditions when the bass are feeding. There’s nothing wrong with fishing one like that. Jimmy Houston, Hank Parker, Roland Martin and a bunch of other guys put together darn good careers doing it. You can also let them fall to the bottom and slow roll them back. That’s good when the bass are hugging the bottom or when you’re fishing after dark. You’ll want a Colorado blade on most of the time when you’re slow rolling. The third way is to burn them shallow just under the surface when the water is clear and there’s plenty of light. This is a killer technique when conditions are right and the bass are actively feeding. But, the best way to bring a spinnerbait back to the boat is to snap or jerk your wrist as you wind it in. This forces the spinnerbait to change directions slightly and, at the same time, it makes the blades clack and bang together. That’s a dynamite combination of things that bass find hard to resist. This is something that Kevin VanDam has done for years but that he doesn’t talk about much. Check out some video of him fishing a spinnerbait. Ignore the fish he’s catching and the bait he’s throwing. Concentrate on his wrist. You’ll see exactly what I’m talking about. If you’re serious about catching more bass put a handful of Molix spinnerbaits in your boat, and cover them over with a bunch of different sizes, styles and colors of blades. There’ll come a time when you’re glad you did.